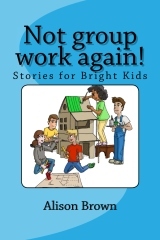 Isaac is a bright boy who does very well academically, but struggles with group work. Always wanting things to be perfect, and wanting to dominate projects, he is often isolated and rejected by his peers. After yet another failed attempt to produce a perfect project, Isaac begins to take note of the more successful groups and their strategies. He learns that effective group work depends on true collaboration, and the ability to build on the strengths of each member of the team.